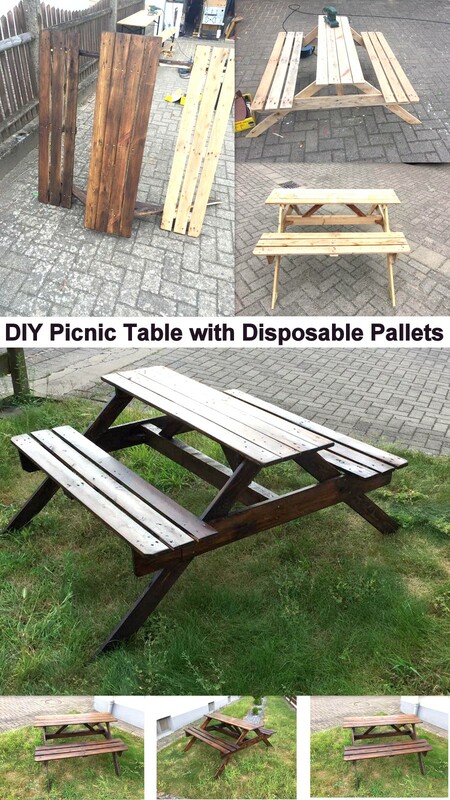 A DIY picnic table, or in simple words a wooden furniture article that is especially made for being used in a picnic, isn’t that quite exciting already? Yes obviously I guess anything related to the picnic is always exciting man. 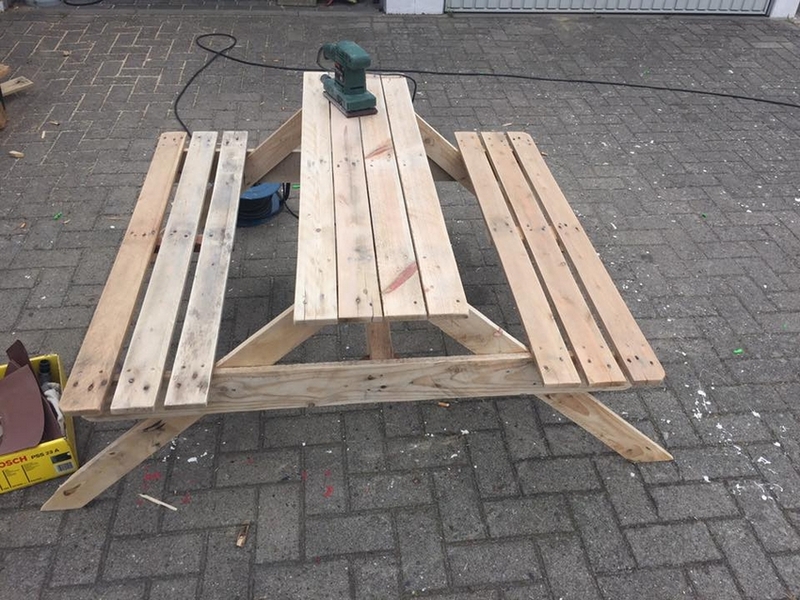 So from the title this has become quite clear that we going to make a wooden pallet table that would be used during the picnic time. We have always tried to classify each and every furniture item according to its use, We have made hallway, side, dining and coffee table. But this is probably a new experience for many of you right? 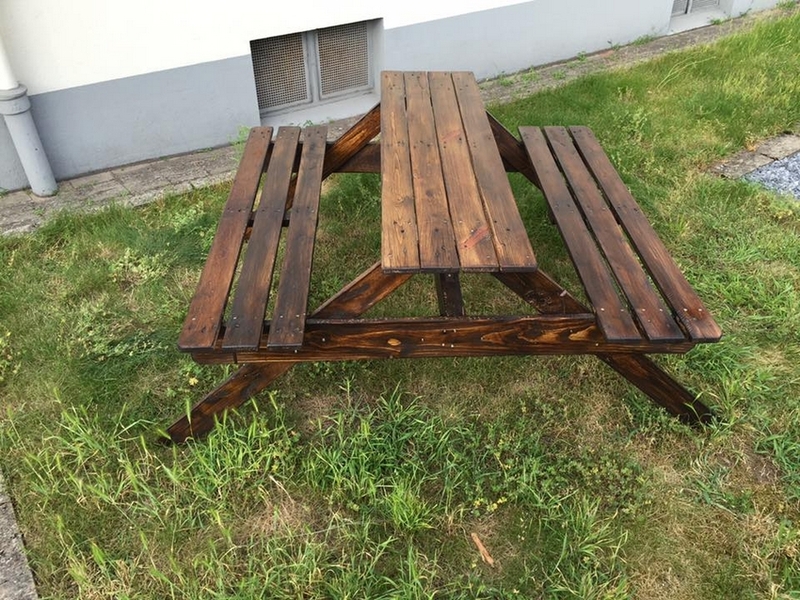 Here in this detailed tutorial we are going to present you guys a whole detailed demonstration of making of this wooden pallet table for picnic. As you can see in the pictures that have literally elaborated the whole process here step by step. What exactly one would expect from a table that is supposed to be used on a picnic spot? Well, this should be slim and easy to carry, this should capture lesser space yet offer big accommodation, and this should be like one single unit so that it could be transferred from one place to another very easily. 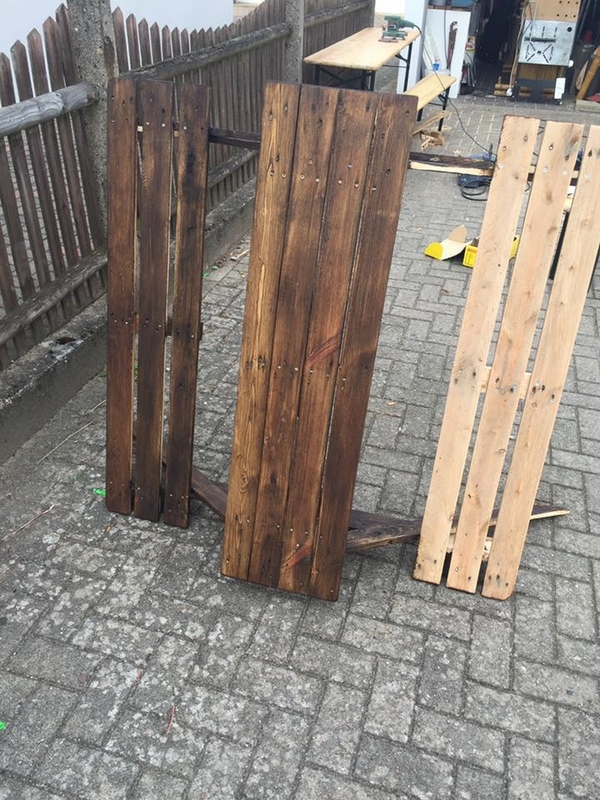 So in the following wood pallet project we are going to take care of all of your expectations for sure. 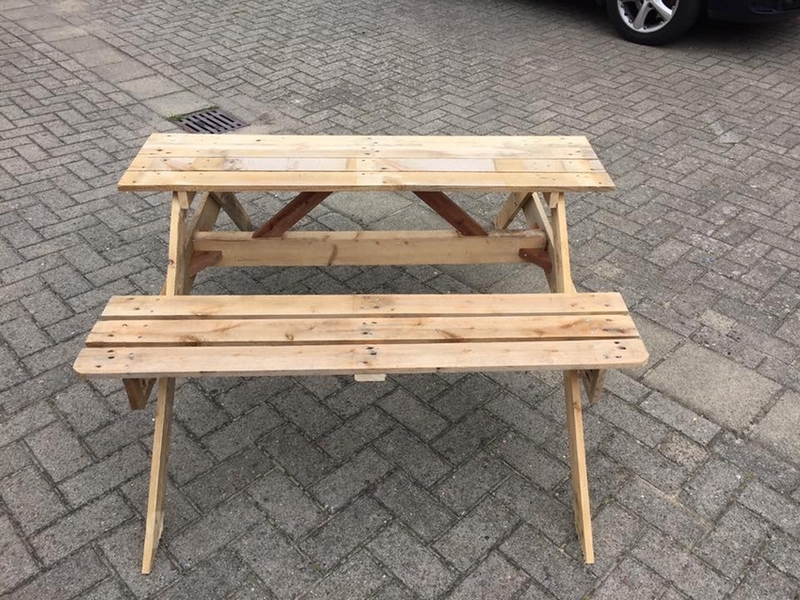 This is the first and final look of the pallet wood recycled table with disposable pallets. Look at it from all the angles as a severe critique and figure out the flaws if any. 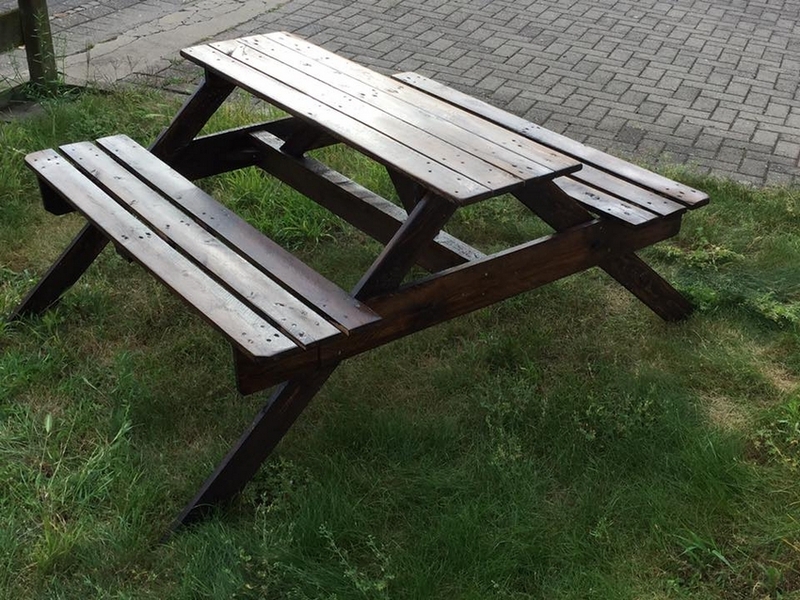 From this angle you can see the sitting space of the attached bench of the picnic table. I think this is pretty reasonable for average sized people, although this could be messy for bulky and fat ones but on the whole this is acceptable. 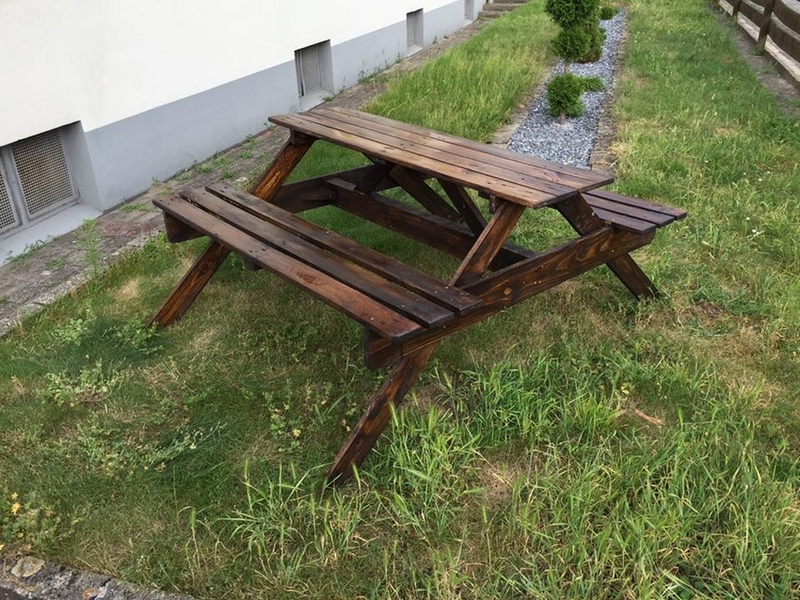 For making it much prettier we have stained it with the most perfect dark brown shade that enhances the beauty of the wooden furniture articles. It would literally shine in the broad daylight. And as far as the design is concerned, that is also phenomenal. 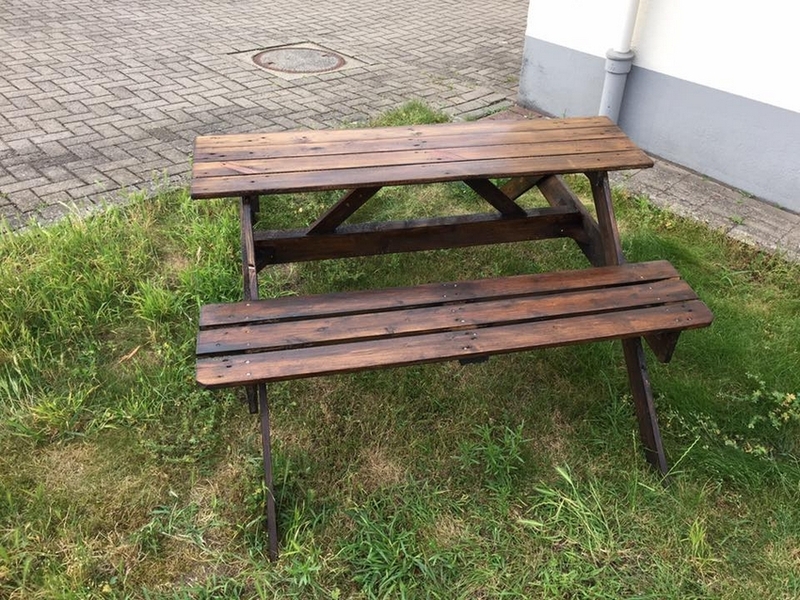 Also look at the table top that would be spared for the serving of edibles, the table top is also very reasonably large where a group of persons could be served at the same time. So it has got style, it has got space, it is one single unit, what else do you want?